The Old Town Saranac 146 Canoe features two contoured seats with seat backs plus a bench seat that is perfect for smaller passengers. How can you improve a centuries-old design? In lots of ways, it turns out. Old Town started from scratch with the new Saranac family of canoes. By narrowing the shape and slightly lowering the seats they have developed a model that paddles better than most recreational canoes on the market. The Saranac 146 Canoe features two contoured seats with seat backs plus a bench seat that is perfect for smaller passengers. 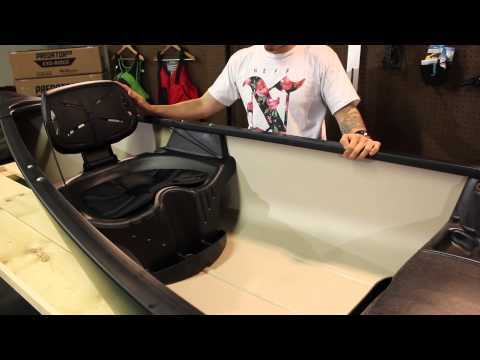 The bench seat also includes a covered storage compartment and the bow and stern seats incorporate a variety of extras including cup holders, rod holders and storage trays designed to add convenience and versatility to the canoe. The Old Town Saranac 146 Canoe is affordable family fun! The ordering was easy the delivery was very accommodating to our schedule. Unfortunately we haven't gotten to enjoy the canoe before winter hit.. it is safely hoisted in our garage and awaiting for spring! Hopefully we can add to our review five months from now. Our rating is based solely on order and delivery. We have had the Saranac 146 out twice so far, and have absolutely loved it. Plenty of room for 2 people to fish comfortably and room for our gear and a cooler. We did add outriggers, which made an already stable boat even more stable. I can highly recommend it, and i can also highly recommend ordering from ACK. The price was great, and was shipped within a week. They also have any and every accessory you could possibly need to outfit your boat to fit your needs. This is a great canoe for anyone. Highly recommended. Nice product. Clean lines, can't wait for warmer weather! Great service from ACK. The canoe was very stable and easy to paddle, looking forward to take my granddaughters out this spring. Great canoe, loved the seats. My daughter and I never canoed together and we had no issues. Easy to fish out of. What was really great was how the company called to thank me when I ordered, checked on the canoe after it shipped. When you just find someone online you never really know what to expect. This is really a excellent company that you can tell appreciates their customers. Very pleased with this purchase! Excellent value. The canoe is working out well on Boston harbor. Awesome Canoe. I bought it for me and my 8 yr old son to spend some quality time together out on the lake. Very stable I had us rocking it side to side just to be sure before we hit deep water. Love it! LOVE this canoe! It's perfect for cruising around the lake shoreline with out Jack Russell terrier. Perfect size for 2 adults and the seats are great! It came in less than a week, was packaged properly and free shipping! Couldn't be more pleased with this purchase! Great product. Austin was awesome! They packed it up correctly. Went to Austin after having ordered the same canoe off of Amazon that was damaged upon arrival as they didn't even wrap it in plastic. Austin's was wrapped and came intact, undamaged. old town Saranac 146 canoe is fabulous especially since it has seating with back supports that eliminates lower back strain. received it approx. 2 weeks ago and have been on the lake as often as possible. Love it. the old town Saranac 146 is perfect for ou needs. We have a cabin where there are lots of rivers close by and two mountain lakes to explore. We are retired and wanted something comfortable which with the adjustable backs on the Sarnac we can make it perfect for each of us. Brought this conoe..Old Town Saranac He really loves it!! Its excatly what he wanted! I brought the Old Town Saranac Canoe For my son. And he loves it!!!! Service was great - canoe was well packed and arrived in ND safely. This is a great canoe to have for kids as it is very stable. I have been paddling for over 40 years now and have several canoes but this is the one I take the young grandkids out in. Absolutely awsome, very comfortable, my daughter and I took it the lake last weekend was in 3 hours it was so comfortable, and easy to navigate, we love it. Most comfortable interior. Love leaning back and relaxing in the padded seats! Love how lightweight it is(easy lifting for my girlfriend and me). Without a &quot;keel&quot; its just about useless for cold, fast water trout fishing on creeks. I had a Old Town wooden canoe for forty years and I'm refinishing my old one and selling this one. If it wasn't such a hassle to ship this canoe back I would have. We camp a number of times each year and normally rent a canoe. We decided to take the plunge and purchased the Saranac 146. We needed a center seat and we did not want to spend a great deal of money. It is perfect for us. Loads of built in options. Light enough my wife and I can load it on the truck, and the seats are very comfortable. It is also very stable on the water. Q: Can you put a small electric trolling motor on this? Q: Is this a good canoe for class 1 and 2 rapids? A: Thanks for your question! This canoe should handle fine in class 2 rapids, but we would not recommend taking this into anything much more rough than that. Q: Do you carry flotation/airbags that would fit well in this boat? A: Yes, we offer various Harmony Float and End Bags that are suitable for the canoe. Q: Can you use a kayak paddle in the Saranac 146 canoe when solo paddling? A: Yes you can use a kayak paddle but we would advise for a better easier time to use a canoe paddle. Q: I live on the beach . Can the canoe withstand salt water and the ocean? A: this boat can withstand some saltwater. I would recommend rinsing the canoe after use with freshwater. Q: How would this canoe perform in rivers? No more than Class III? It looks as though the bottom is flat as well as no keel. A: As long as you don't hit anything too rough you would be fine. Q: Hello - Very interested in your Saranac 146. Here's my concern, I would be using this canoe mainly in the potomac river, lots of rocks! How will the bottom hold up going over these rocks? Thanks. A: Thank you for your question! This boat is made of thermoformed polyethylene and is thus very durable. Under normal use these boats will last years, and they are even a popular boat for scouts to use and are put through all kinds of abuse which they always come out of looking fine. hope this helps!